The Good Times Blog: I'm the Leprechaun! I didn’t know it was possible, but Michael Jackson has thought of a new and exciting way to frighten children. 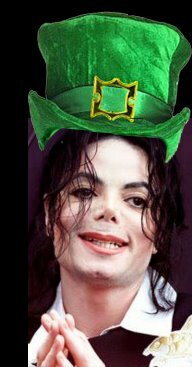 Whacko Jacko is in talks with “businessmen” to pull together the $635 MILLION he’ll need to open a Leprechaun inspired theme park in Ireland. Having accidentally seen the movie “The Leprechaun” when I was just a wee lass (of 13), the idea of an entire theme park full of them makes me crap my pants. I have a feeling that this was probably how Jackson pitched the idea, “I’m thinking of opening a theme park. And the theme park will be full of leprechauns. And the leprechauns in the park will be played by child actors. And the child actors will have a dressing room so they can put on their leprechaun clothes. And I’ll be in charge of overseeing that dressing room.” Now THAT is magically delicious! Last time I was in Ireland, I felt that something was truly missing. I've been racking my brain all these months to figure out what it was. Thank goodness for Jacko. He truly is my pot of gold at the end of a rainbow. A Leprechaun themepark. By golly - that's gonna be fantastic. P.S. When I say "fantastic," what I actually mean is terrible...and offensive. You know, it has only been the last 10 years that the Irish have been able to right themselves after 1,000 years of abuse. Now this?